OpsGenie introduces new capabilities to help organizations be better prepared for handling IT incidents using Incident Response Templates. Incidents happen - It’s how you respond to them that matters! With our new Incident Response Orchestration features, OpsGenie is taking a giant stride forward in helping organizations become proactive about their incident response planning and reduce their MTTR. 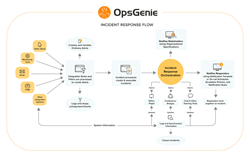 OpsGenie, the provider of leading alerting and on-call management platform for development and operations teams, announced the availability of its new Incident Response Orchestration platform. Get a comprehensive, centralized view of their organization’s services infrastructure. Interactively or automatically aggregate related alerts into incidents. Leverage Incident Response Templates to proactively plan for different incident scenarios. Define communication channels and collaboration methods for responders. Effectively communicate with stakeholders during incident resolution process. Continuously improve the incident response practices using incident postmortems. OpsGenie’s new Incident Response Orchestration platform is available immediately. If you are interested in trying the new features, please contact our Customer Support team at support(at)opsgenie(dot)com. About OpsGenie: OpsGenie is an alerting, on-call management and incident response orchestration solution trusted by development and operations teams in over 2500 organizations worldwide. OpsGenie provides the tools needed to design actionable alerts, manage on-call schedules and escalations, and orchestrate communication & collaboration during incident resolution process. Learn more at http://www.opsgenie.com and follow us on Twitter @opsgenie.